Today human beings have been advancing in technology and other fields at a rate which seems incomprehensible, but at the same time our needs have increased as well. Mankind is now exploiting fuel resources at the rate faster than which, those resources can be replenished. At this rate, we might have to face An Energy Crisis in the near future. Now, to tackle this problem we must shift our focus to Alternative Sources/Renewable Sources of energy. Some of the Renewable Energy Sources include: Solar, Wind and Tidal Energy. Out of these, Solar Energy is available very abundantly. 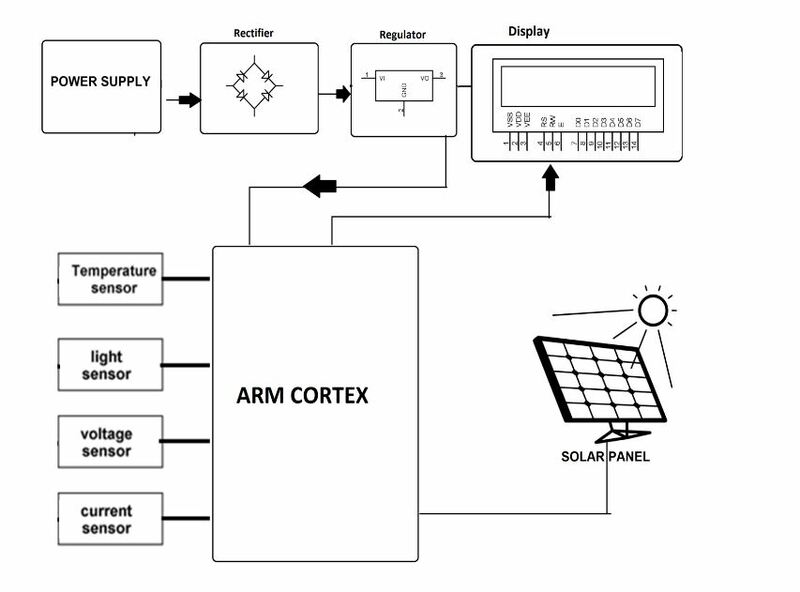 And with the help of this project, System to measure solar power using ARM CORTEX; we attempt to harness the Energy of the Sun. 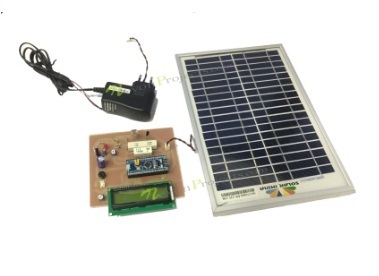 This project deals with Solar Power and its parameters. 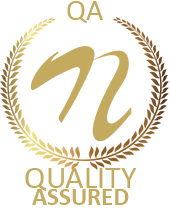 Our system is designed to measure the voltage, current, temperature and light intensity of the energy incident on it. 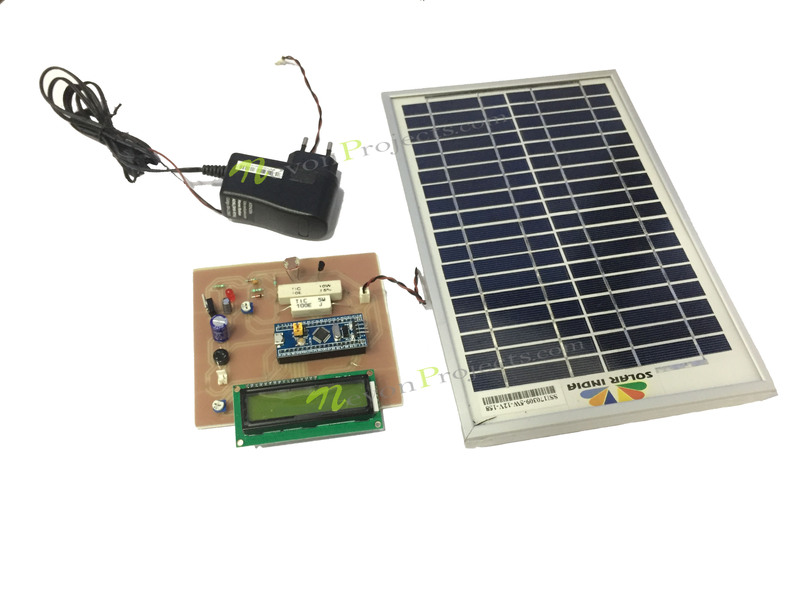 A Solar Panel is used to convert the incident sun-light into DC voltage. An LDR is used to sense the intensity of the incident sun-light. A temperature sensor senses the incident heat. With this arrangement, it is possible to significantly take a small part of the Sun’s Energy and measure its parameters. With the help of an ARM CORTEX board and an LCD, we can take the values from the sensors and display them. The ARM CORTEX board has an inbuilt ADC which helps to convert the raw sensor readings into user understandable values. Once the board has converted the sensor readings, it then displays them on the LCD. 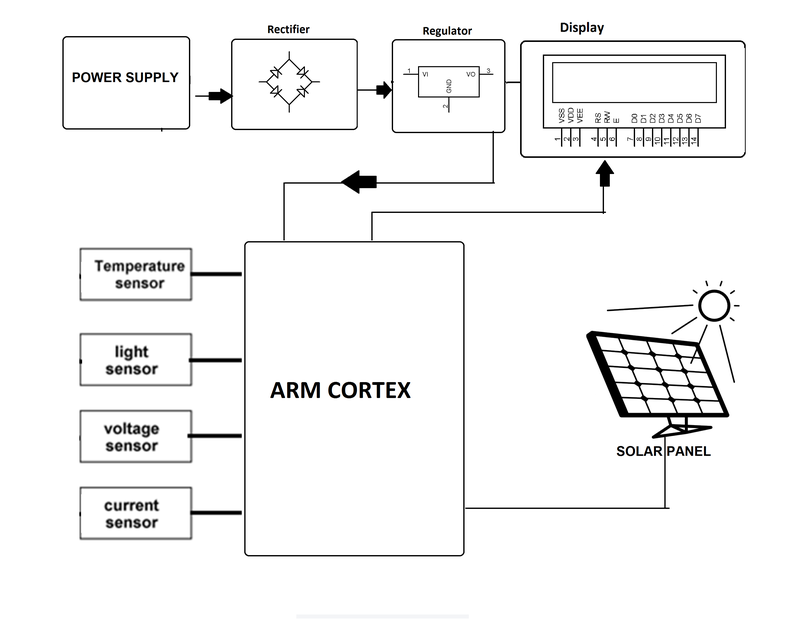 At a later stage, the concept of this project can be applied to develop a system so as to use the harnessed Solar Energy for running different peripherals. The energy can be stored by a battery and this battery can then be used to power different D.C. appliances. And in this way, we offer a method to obtain energy from a renewable source thereby, taking a step towards A Clean and Green Future.